Craving that buttery, indulgent scampi taste but not looking forward to all those calories? Try this just-as-delicious but lighter-than-you-think recipe from Monica Wants It. When the shrimp has about 10 minutes left, begin to prepare your zoodles, lemon zest, parsley and tomatoes. 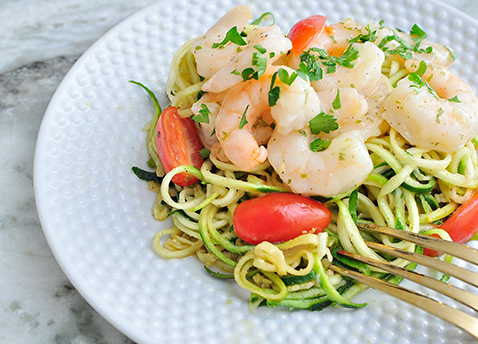 Take the shrimp scampi out of the oven, and then cook your zoodles for 1-2 minutes. In a pan over medium heat, add in the olive oil. Once that’s heated, toss in your zoodles and cook about 1-2 minutes. Once they’re done, transfer zoodles to a large bowl and toss in lemon zest, lemon juice and tomatoes, plus salt and pepper to taste. 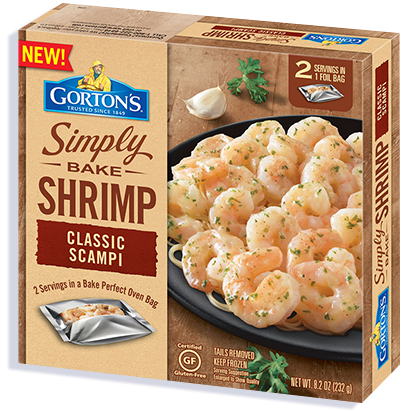 Plate your zoodles and top with Gorton’s Simply Bake Shrimp Scampi (about 7-9 shrimp is half the bag). Also drizzle some of the sauce from the bag over the shrimp and zoodles for a buttery, lemony taste explosion. Add optional parsley, minced garlic, or parmesan. To serve as an appetizer, serve individual portions on on mini plates. Plate a fork swirl’s worth of zoodles, 1 shrimp and 1 cherry tomato half on each plate. Tender tail-off shrimp with garlic, butter & parmesan cheese.